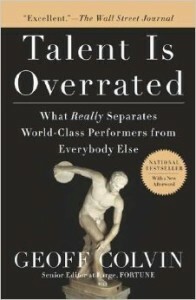 Talent is Overrated is a book arguing that world class performance is a result of deliberate practice instead of innate talent. The book starts by arguing that talent is less important than we usually think and debunks popular examples like Mozart or Tiger Woods by explaining how much their success is a result of their lengthy training in their field and having parents that were good teachers: Mozart’s father Leopold Mozart was a famous composer or Tiger Woods was born into the home of an expert golfer. The author shares research on how IQ or memory doesn’t drive great performance and argues that hard work and deliberate practice makes all the difference. It ends with explaining how individuals and organizations can apply these principals to have high performance. Overall, it was an interesting read that was also pretty motivational.